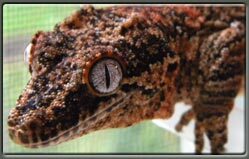 In most cases it will take about two weeks for a newly acquired gecko to settle in and start feeding regularly. During this time it is very important you handle your new gecko only when necessary. Before your new gecko arrives, you should have its new enclosure ready to go. Any changes to an enclosure after your new animal is introduced will basically restart the acclimation period. I have found newly acquired animals as well as babies tend to do much better much faster if they are housed separately in small enclosures with just the basics like food, water, and a good hiding place. Smaller enclosures help to more easily maintain humidity and monitor feeding. Plastic tubs with paper towel liners have always worked best for me. They are easy to handle, clean and sanitize, and they maintain a more consistent humidity level without being wet. Temperature and humidity are the keys to a speedy acclimation. I recommend keeping new arrivals and babies warm at temperatures of 77-80°F and consistent humidity levels around 70%. Hide spots are very important too—they should be places that are small and dark—ideally something that they can crawl into. Fresh water should be available at all times as well as a small portion of mixed diet. Once they are settled in and feeding regularly, you can introduce your gecko to handling a little at a time. Five minutes of handling per day for the first few weeks is sufficient to allow your gecko to become used to you and to become less jumpy. As they get more comfortable with you, you can begin to handle them more. 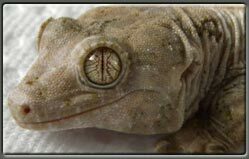 Gargoyles, Chahoua and Crested geckos are all semi-arboreal omnivorous geckos endemic to New Caledonia. They feed on both live insects and fruit based diets and in most cases can be kept at average room temperatures. 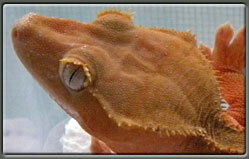 Under proper care, these geckos have the potential to be very long lived; 15 to 30 years! The husbandry requirement for all three species is essentially the same with only minor differences in enclosure size and nutritional needs. These geckos are generally calm, tolerate handling well and can become quite tame even when they are relatively young, however geckos that are less than two weeks old, or geckos that have recently been purchased or moved should be handled only when necessary. These geckos can be kept individually or in small groups containing only one male per enclosure. Males cannot be housed together. Adult housing for all species should be vertically orientated with good air flow and plenty of places to hide. Babies should be housed individually and can be raised in plastic shoe or sweater boxes. They can stay in containers like this for up to a year.